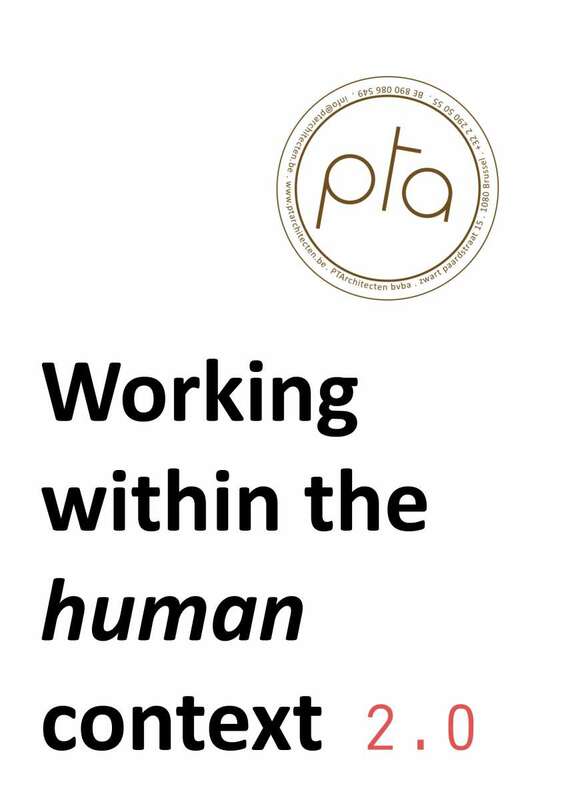 all PTA projects are assessed on three axes : Human Context - Open Ended - Interaction. Both project and process are combined in a simplified diagram. 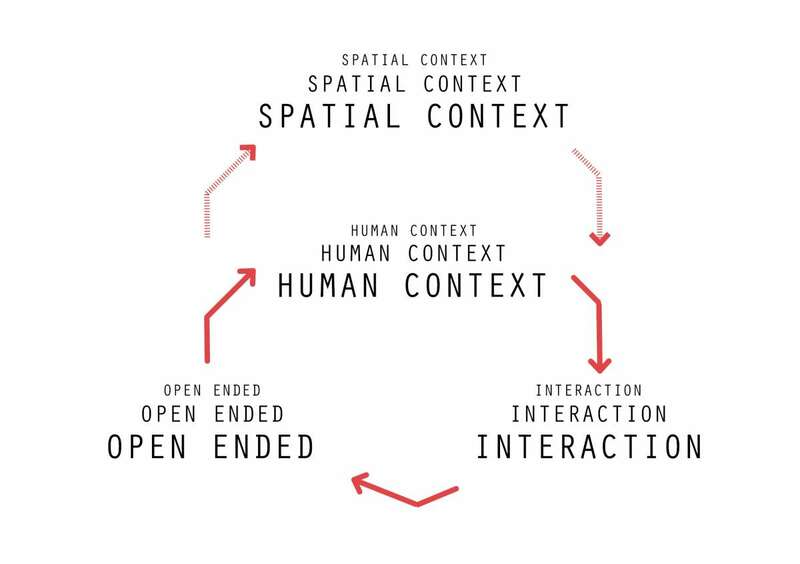 These three concepts are taken from the method for a human based design process that is described below. It gives us a tool to evaluate and compare projects on their ability to provoke social relevance and a 'joie the vivre' for their users. The larger the triangle formed by the quotes on the three axes, the higher the impact on the human context. 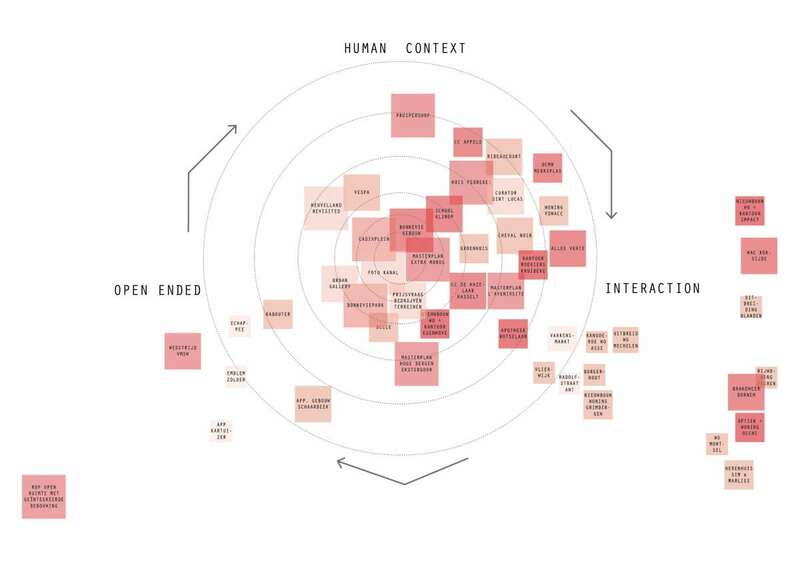 We are developing a method for a human based design process. 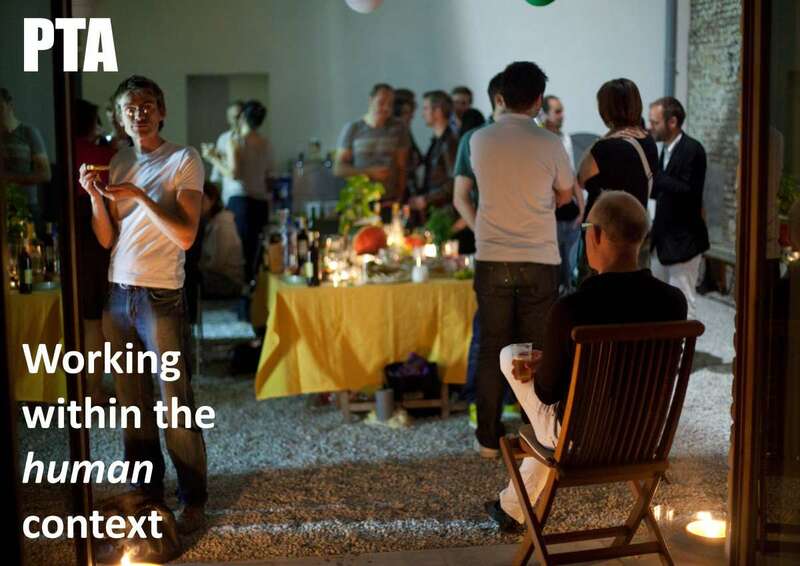 This means a design method that enables to improve the social relevance of projects. It can be applied to projects of different scale : from interior architecture to landscape strategies. What should be the attitude of a designer in today's society where all certainties threaten to disappear? How to contribute something small to society in order to create a stronger tissue, a safety net, a solid foundation. How to pursue a Joie de vivre for the users, passers and ourselves ...? What is or could be the role of the designer in this complex world ? We are developing the method by a practice based research. The research uses projects of our office PTA as test cases. 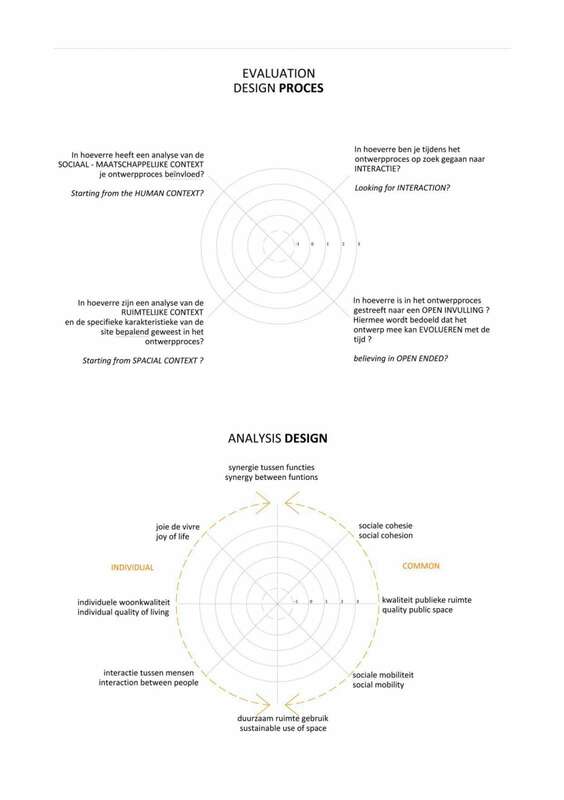 PTA developed 2 diagrams to evaluate the design process and the design result. Both common and individual values of a project are taken into account. It gives us a tool to evaluate and compare projects on their ability to provoke a common relevance and a ‘joie the vivre’ for their users and the larger human context. Het traject Omgeving op mensenmaat is een gezamenlijk initiatief van de provinciale diensten ruimtelijke planning, gebiedsgerichte werking en welzijn (wonen) van de provincie West-Vlaanderen. PTA is invited to present their research on a human based design process at the international Atiner Conference in Athens, Greece. Discover the selected paper. 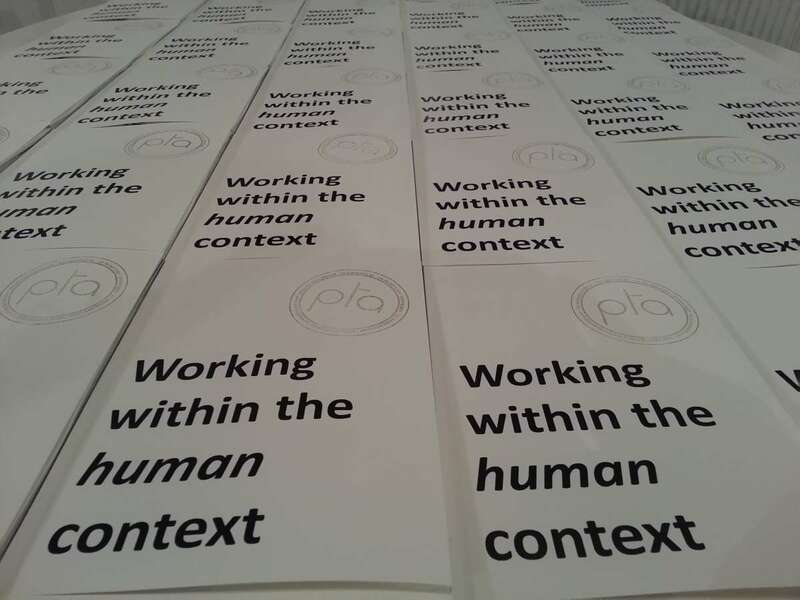 For a conference in Athens, we tried to assess a majority of PTA projects so far, on the three axes Human Context - Open Ended - Interaction.. We realised that the projects in the middle, which take into account the three axes of the design process in a balanced way, are the projects that we like the most. Heuvelland Revisited I Tentoonstelling in de Singel nov 2011 - jan 2012 Selectie door Vlaams Architectuurinstituur (VAI) voor ‘Jonge makers, denkers, dromers. Presentation of PTA research at the RMIT conference in Ghent, Belgium.